uuid : db9d5a55-ba57-44d0-a4e5-a3bbe2d193a1 templates_id: 119571 templates_uuid: "b5bd06c2-8b97-4c24-afb6-6852edbd7e79" title: "Revocation of Power of Attorney - Create a Deed of Revocation Online" display_name: "Revocation of power of attorney" meta_keywords: "Deed of revocation of power of attorney and POA revocation" description: "
Provide your Attorney with the notice they are entitled to if you decide to revoke or cancel their appointment with this deed of revocation. This revocation of power of attorney covers the revocation of a previously appointed attorney because you\'re not happy with your attorney, the power needs formal renewal or because you no longer need the power. Make sure the Attorney is aware of the revocation in order to avoid them continuing to exercise their powers with the result that their actions could still be valid. 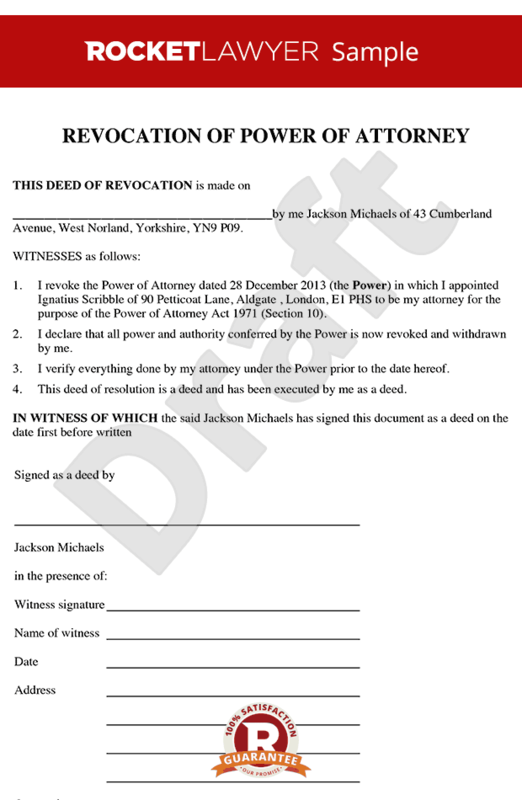 Who can revoke a power of attorney (POA)? Only a donor with mental capacity can revoke a power of attorney. The donor should complete the revocation of power of attorney. The attorney must be notified that their power to act has been revoked. During notification, the donor must demand the return of power of attorney to them. If the power of attorney was registered with the Office of the Public Guardian (OPG), the donor must send the OPG a copy of the revocation and ask for it to be removed from the register. Do you have to give notice to the attorney? Yes. The attorney must have notice of this revocation to end the power. It is a good idea to get the attorney to sign a copy of the revocation to confirm that they have had notice. If they are not aware that the power has been revoked, they are able to continue to exercise their powers and their actions may well be valid. A power of attorney can be cancelled at any time, as long as the donor still has mental capacity. What happens if the attorney dies? The power of attorney will end if the attorney dies and there is no replacement. If the power of attorney is registered, the donor must tell the OPG and provide them with: a copy of the death certificate, the original and all certified copies of the power of attorney, and a return address where the documents can be sent back to. Can the attorney witness the revocation? No, the attorney should not be a witness to the donor\302\222s signature on the revocation. What happens to a power of attorney when the donor dies? When the donor dies, the power of attorney ends automatically. After death, the donor\302\222s affairs will be looked after by the executors or personal representatives at this point, not the attorney. This revocation of power of attorney is governed by the law of England and Wales.
" created_timestamp: "2018-10-08 04:37:01.0" modified_timestamp: "2018-10-08 04:37:01.0" active: true created_by: 236 modified_by: 236 dcm_id: 286 url_slug: "Revocation-of-power-of-attorney" meta_description: "Let Rocket Lawyer help you prepare a deed of revocation when you\'ve previously appointed an attorney who you no longer require. You\'ll need this form to revoke or cancel that attorney\'s appointment. Try this revocation of power of attorney." time_to_complete: "10 minutes"
Provide your Attorney with the notice they are entitled to if you decide to revoke or cancel their appointment with this deed of revocation. This revocation of power of attorney covers the revocation of a previously appointed attorney because you're not happy with your attorney, the power needs formal renewal or because you no longer need the power. Make sure the Attorney is aware of the revocation in order to avoid them continuing to exercise their powers with the result that their actions could still be valid. No, the attorney should not be a witness to the donors signature on the revocation. When the donor dies, the power of attorney ends automatically. After death, the donors affairs will be looked after by the executors or personal representatives at this point, not the attorney. More than just a Revocation of power of attorney template, our step-by-step interview and guidance makes it easy to create your document. Easily create online, download, print and sign your free Revocation of power of attorney in minutes. This document is also sometimes called: Deed of revocation of power of attorney and POA revocation.